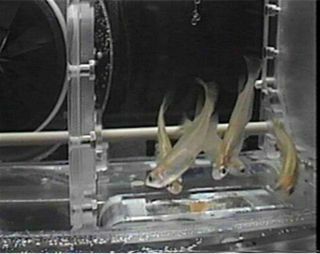 The above image shows an Aquatic Habitat, or AQH, specimen chamber housing Medaka fish for study on the International Space Station during the Expedition 33/34 mission in 2012. When the next Russian-built Soyuz capsule launches to the International Space Station in October, it will deliver three new crewmembers to the orbiting outpost. But the trio of spaceflyers will be sharing their ride with some special cargo: 32 small fish for a science experiment at the space lab. NASA astronaut Kevin Ford and Russian cosmonauts Evgeny Tarelkin and Oleg Novitskiy are scheduled to launch to the International Space Station on Oct. 15 from the Baikonour Cosmodrome in Kazakhstan. Their Soyuz TMA-06M capsule will also be carrying 32 medaka fish — a type of fish native to Southeast Asia — to the orbiting complex. The International Space Station's Expedition 33 crew. From left: NASA astronaut Sunita Williams, Russian cosmonaut Yuri Malenchenko, Japannese astronaut Akihiko Hoshide, Russian cosmonauts Evgeny Tarelkin and Oleg Novitskiy and NASA astronaut Kevin Ford. "They'll be on our Soyuz with us — 32 fish, plus the three of us," Ford told reporters in a news briefing Thursday (July 26). "When we come onboard, one of the first items will be to get these fish transferred and into their habitat and get the experiment underway," Ford explained. The fish will stay in a special aquatic habitat that is being delivered to the space station by a robotic Japanese cargo freighter. The Japanese unmanned H-2 Transfer Vehicle-3, or HTV-3, launched into orbit on July 20, and arrived at the space station today (July 27). The grid structure at the upper side of each Aquatic Habitat, an aquarium for the International Space Station, captures air in each grid, while preventing water from escaping. Air will be injected with special syringe by the crew prior to the start of an investigation in 2012. Scientists are particularly interested in how the skeletal systems of fish change in the near weightless environment aboard the space station, said Julie Robinson, an International Space Station program scientist. It has long been known that exposure to microgravity for extended periods of time can carry negative consequences, including loss of muscle and bone density. To prevent lasting harmful effects, space station astronauts adhere to rigorous exercise regimens, and doctors on the ground closely monitor their health. But experiments such as the one with medaka fish do not hold potential benefits for only spaceflyers. The results of these types of studies can have far-reaching effects on Earth, too. "It's an experiment, essentially, for osteoporosis," Ford explained. The lessons learned from studying the skeletal systems of fish in space can inform scientists on the ground about how bones degrade over time here on Earth. This type of scientific research is part of what inspired the motto for this space station-bound crew: From the Earth, for the Earth. "The idea is that the space station is up there for everybody, and even though it's essentially 15 countries that put [forward] their resources, it's really there for everybody on the planet." But for Ford, Tarelkin and Novitskiy, the medaka fish will also be their companions for the thrilling journey to the International Space Station. "I won't have my 'gone fishing' hat, though," Ford joked.